The new single Shoot It Out by alternative metal band 10 Years took some fans by surprise when Sirius/XM Radio spun it in June. It's heavier. It's louder. It's an intro to the new "experimental" promised for Feeding The Wolves, the next album due out in August. For vocalist Jesse Hasek, Ryan "Tater" Johnson (guitar), Lewis "Big Lew" Cosby (bass), and Brian Vodinh (drums), it's also a big change. Big enough that the transitions between hits from their album The Autumn Effect (2005) and safely played Division (2008) aren't completely seamless at live performances. However, the band says the song has become a crowd favorite. The two power ballads Cosby refers to are Beautiful and So Long, Good-bye on Division. 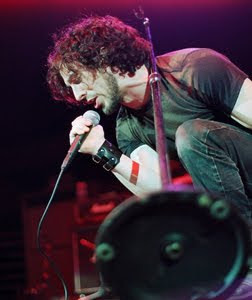 They are among the most popular songs that the band has produced to date, along with Wasteland from their Autumn Effect album. Wasteland and Beautiful are still prominently covered on the 10 Years Website, with links to Universal Republic. I agree with Cosby. Beautiful is good, but the power ballads don't match the band's potential. Shoot It Out feels raw. The simple lyrics are a dialogue between the wolves who demand production against the strained harmony of the suffocating artist. Why don't the critics get this? It's not a shootout. It's a cry out. "I think that the reason we chose to go with Josh Abraham is because we noticed that every project he's worked on, the bands all sound different," said Hasek. "They don't sound the same like the producer made it sound like their spin on their music, you know?" 10 Years - Shoot It Out Reaches A 7.3 On The Liquid Hip Richter Scale. The 7.3 is conditional. 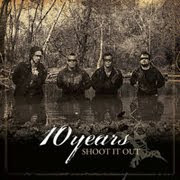 I love the song and if Shoot It Out is what we can expect in August, then 10 Years will break away from the shadow of bigger nu metal bands. If not, well, you know, they'll forever think Sevendust makes it look easy. Shoot It Out is also on Amazon. Most fans on iTunes are looking for a hit, even if the studio seems uncertain. Right now, you can download the song for free if you buy a "merch" item on tour. They don't mean online merch. There is nothing new in the 10 Years merch store as of today. Come on, Universal Republic, get behind the band.